When it comes to flamingo coloring, there's usually little deviation from standard fashion. But for one bold bird caught on film in Israel, black is clearly the new pink. While on a trip in the Eilat region near the Jordanian border, Dan Presser of California ran across one of the most unusual sights in the avian world -- a nearly all-black flamingo, wading in the water alongside its typically rosy-hued counterparts. At first, Presser couldn't quite believe what he was seeing, so he asked his tour guide about it. "He said, ‘That can't be a flamingo. There's no such thing as a black flamingo,'" Presser told the Monterey Herald. Unconvinced, he decided to zoom in and snap a few photos anyways, collecting good evidence of his remarkable discovery. 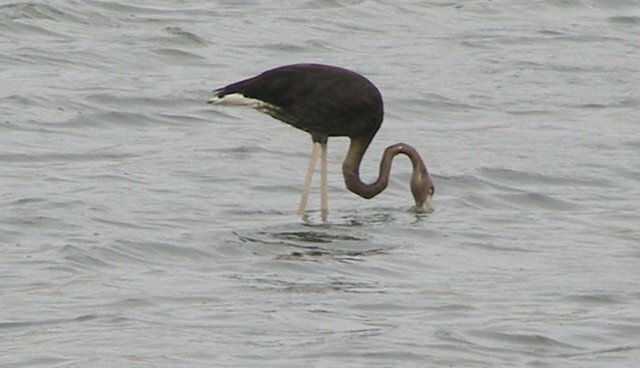 Once back home, Presser sent along his photographs to a local bird expert who confirmed that the bird was indeed a flamingo that appeared to have a condition known as melanism, a genetic irregularity which causes animals to develop more melanin than usual, turning them a dark shade of brown or black. There have been other sightings of an all-black flamingo before along their migration route from Europe to Africa, but given the rarity of this condition, Presser suspects that they have all been of the same bird. "I think there's only one, but there might be more," he says. This isn't the first time that a bird has made headlines for its unconventional plumage. In 2010, an all-black penguin was photographed on the island of South Georgia, near Antarctica. At the time, biologists described the discovery "one in a zillion kind of mutation." Fortunately, the black flamingo looks healthy despite being a bit different than the rest of the flock. And if the bird's embarrassed about it, well, it's certainly not showing.